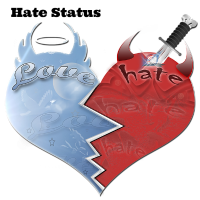 Enjoy best, short, cute, cool hate status for Whatsapp in Hindi, English. Get latest, hurt, funny, new and updated hate status for Whatsapp , facebook. Only unique hate quotes or messages. If you want to show your hates to your opponent or the rest of the world via SMS, quotes or status, then enjoy our best and short collection of hate status for Whatsapp. Can read: Dushmani Status in Hindi for Whatsapp. I hate people who poke in personal life. No time for love, surrounded by hated people. It’s true I hate you, only when you don’t love me. Attention “ We required people who spread love across the border”. I love a person whom I hated most. Sometimes hate is the best replacement for the love. I hate seeing around with the losers. Tease your opponents by a cute smile, It will kill their smile. I hate hurting people but I will hurt someone for my love. I loved you from my heart, now I hate you from my head. I loved you emotionally, I hate you passionately. I don’t count people who hate me. Haters motivate me to give my best. Stars have a fan following, I have haters followings. I love girls but hate loving them from the heart. Do people hate you for no reason? Just give them a solid reason. I love you for your charm and beauty, hate you for residing in many hearts. Do you hate me for my beauty? Fool, people die to get such beauties. I wish I could hate myself. Can read: Insult SMS in Hindi, English. Ok, so you want Hindi hate quotes to show your feelings, then use our new, updated collection of hate status for Whatsapp in Hindi. enjoy only short, cool and funny hate quotes. Can read: Best Jealous status for Whatsapp. तुम मुझे hate करते हो मेरे silence के लिए, कभी पूछा, मैं शांत हूँ किस लिए? किसी को Hate करना, एक लाइलाज़ बीमारी है, फिर भी " Get well Soon ". तुम मुहसे hate करते हो क्योंकि मैंने date के लिए पूछा? नहीं पूछता तो तुम्हारी दोस्ती का test कैसे होता? क्या कहा, आपको बेइज्जती पसंद नहीं? फिर गधों जैसे सवाल क्यों पूछते हो? Can read: Revenge status for Whatsapp, Facebook. We have witnessed the awesome collection of hate status for Whatsapp in Hindi, English. If you enjoyed reading our status or quotes then do share it with friends on social sites. If you really enjoyed reading best hate status for Whatsapp, facebook then likes us on facebook. It will motivate our team to write more cool, cute and funny Whatsapp status.